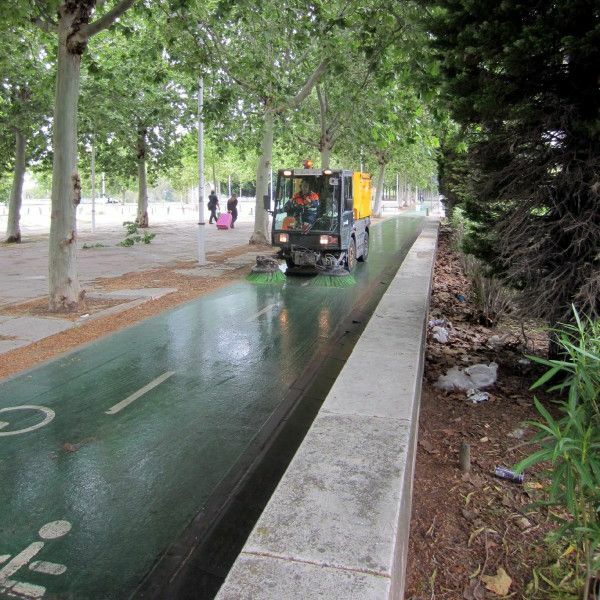 Seville is ranked as the fourth most cycle friendly city in the world by the Copenhagenize index. Not because of the proportion of trips made by bike – it still falls way below many Northern European cities in that respect – but because of the rapid growth in cycle usage that it has achieved in a short space of time. In 2006 the modal share for bikes was 0.5%, only a about a quarter of the (very low) rate in Greater Manchester. By 2012 this had risen to 7%, not far off the level that TfGM are aspiring to by 2020. The size of Seville – nearly 1 million- is comparable to the population within the M60, the area covered by Velocity. There are other similarities: it’s pretty flat, there is a modern tram system (though much less extensive than Metrolink), and a large student population, but also differences: the old centre is a tangle of narrow streets (many of which are pedestrianised, and the remainder sufficiently difficult for motorised traffic to negotiate to minimise car penetration). Oh and it tends to be sunny and dry…. A recent family holiday in the city gave me the opportunity to find out what it was like to cycle there. I hired a bike – a bit of a clunker, but there are no hills to speak of – and spent a day exploring. Unsurprisingly pedestrians ignored these on busier streets. Most of the narrow streets were one way, with no contra flows. The old centre was not exactly permeable, though the density of pedestrians obviously poses a challenge. 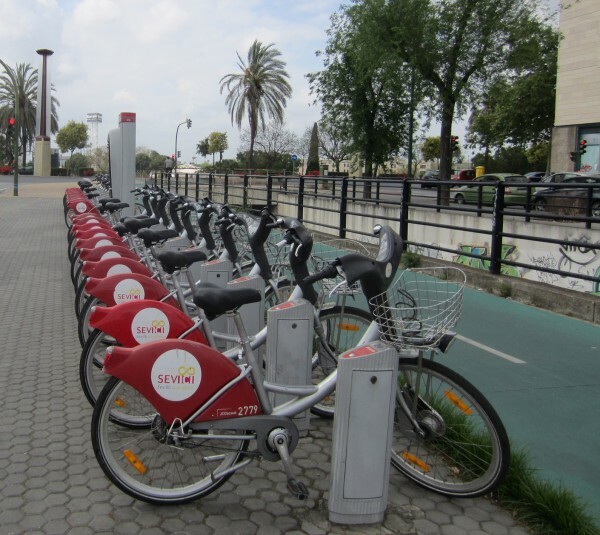 They have a public bike hire scheme, with 250 bike stations. I tried to hire one; the hardware in the first two stations was not working, the third debited my credit card but failed to issue me with the necessary ticket to actually use the bikes…. 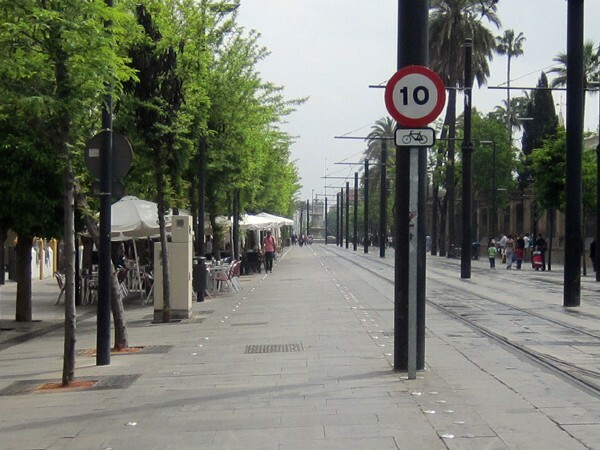 So what can Greater Manchester learn from Seville? 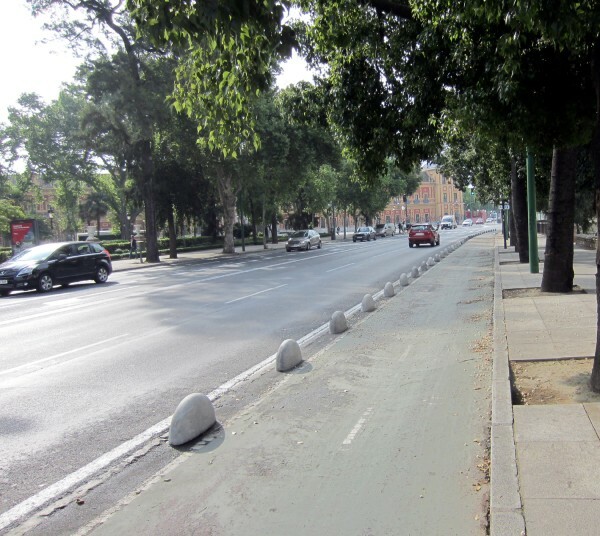 Most importantly, that starting from a very low base, it is possible to massively increase cycle use in a short space of time, given the political will. 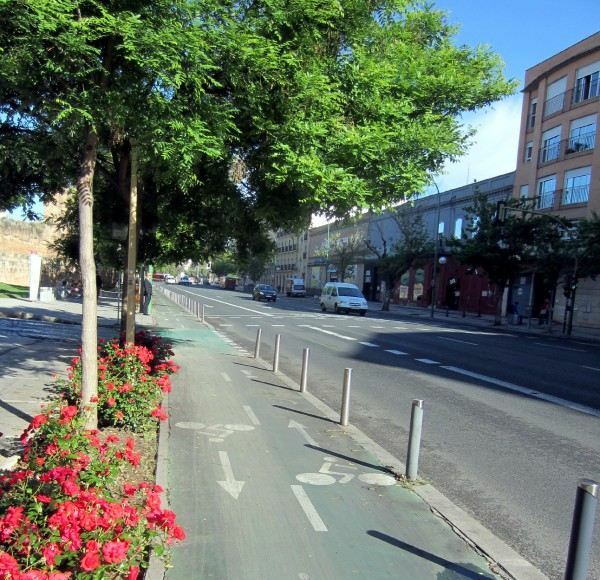 It was largely down to the head of planning in the council, with political backing, who believed that with the right infrastructure the bicycle could solve Seville’s traffic congestion problems. The basic structure of 50 miles of routes was put in in just one year, with an extension to 80 miles done over the next three years. 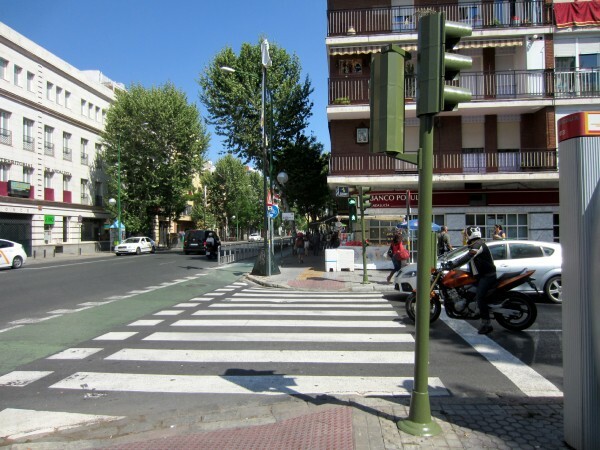 Political leadership was crucial; the newly elected council diverted €10M from various urban development surcharges and complemented it with €18M from the general transportation budget to create the basic network. 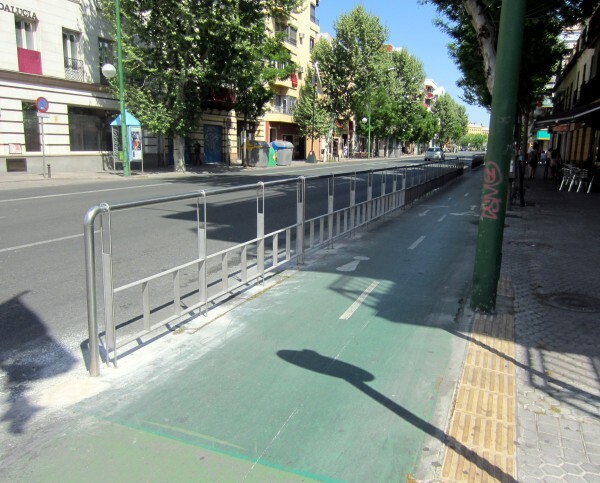 85% of the space necessary to create the network was pinched from the road space. 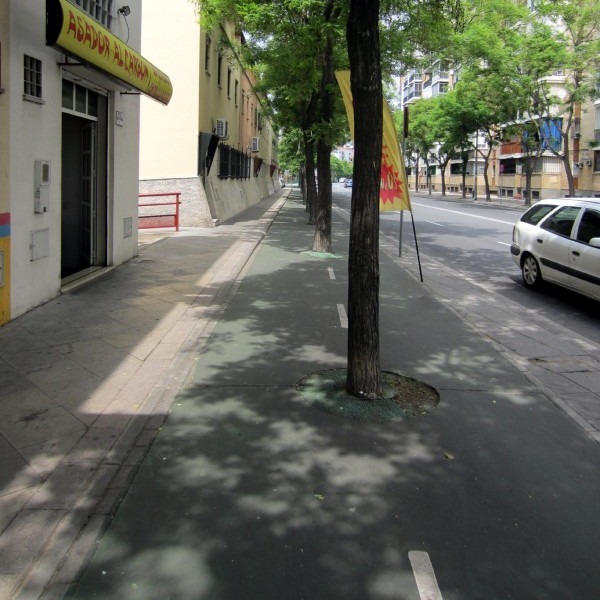 Some road lanes were taken out altogether, others “trimmed”, and 2,600 parking spaces removed. 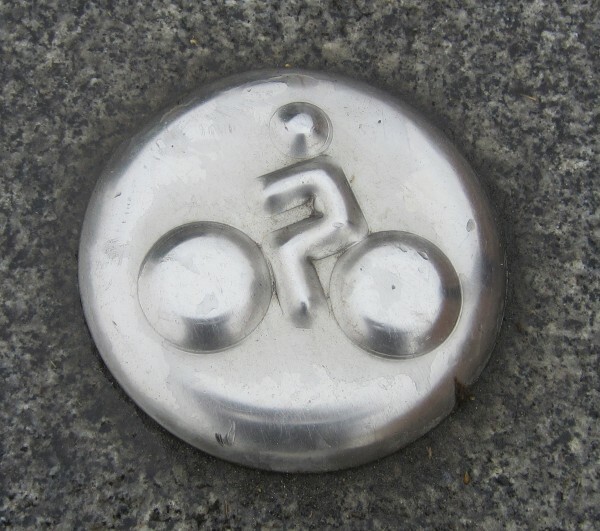 The €32m cycle network carries 72,000 cyclists (compared to 5000 in 2004) on weekdays compared with the city’s underground system, which cost €600 million and carries 40,000 people daily. Perhaps the crucial point is that the initiative was planning led, and the primary motive was to reduce traffic congestion. It is an argument that might even appeal to our car-centric media: If you want to spend less time stuck in a traffic jam, the cheapest way to do it is to build a good cycle network.